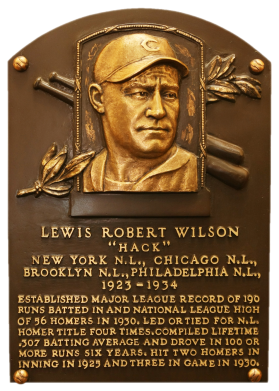 For five seasons, from 1926 to 1930, the muscular, midgetlike Wilson was one of the game's greatest sluggers. 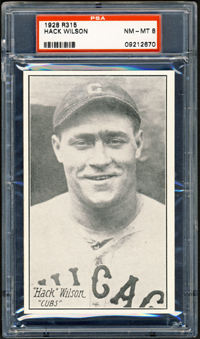 In 1930, the Cub outfielder hit an NL-record 56 homers and knocked in a major league record 190 runs. He led the NL in homers four times and in RBI twice. Liquor, nonetheless, was Wilson's downfall, and by the end of 1934, he was out of baseball. Comments: In September, 2000 I purchased a group of 1980 TCMA tribute cards including a Hack Wilson. 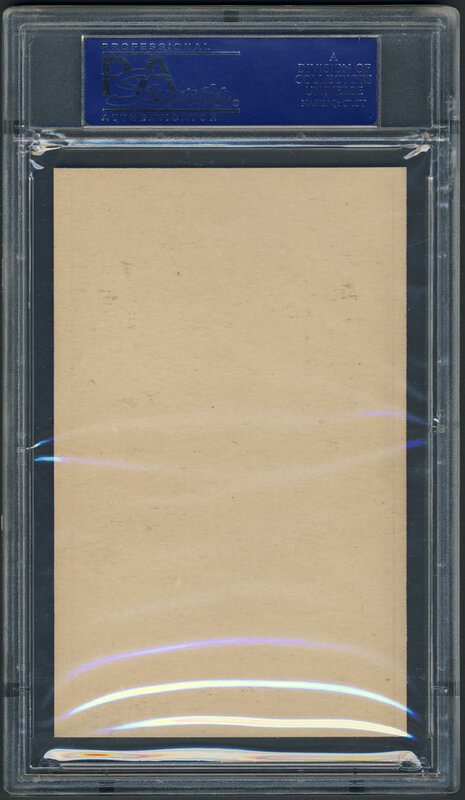 The card was eventually graded by PSA and a placeholder until I found a portrait contemporary to his career. In March, 2008 I won an eBay auction for an Authentic SGC 1928 R315 card. His gin on the card is classic, looks a little drunk. The card didn't meet the size requirements for the issue so it didn't get a numeric grade. On January 6th 2009 a friend in the hobby, Jeff Britton, sold me this beautiful PSA 8. 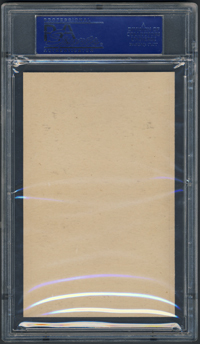 Description: This issue was apparently released over the course of at least two years 1929 to 1930, based on observed player/team combinations, the 58 cards in the set can be found in either black-and-white or yellow-and-black. The unnumbered blank-backed cards measure a nominal 3-1/4" X 5-1/4" though original cutting variances abound. The cards either feature portraits or posed action photos. The set includes several different types of cards, depending on the caption. Cards can be found with the player's name and team inside a white box in a lower corner; other cards add the position and team in small type in the bottom border; a third type has the player's name in hand lettering near the bottom; and the final type includes the position and team printed in small type along the bottom border.